It turns out that creating Virtual Reality (VR) is pretty hard. Creating good VR is even harder. Creating good therapeutic VR is like scuba diving without oxygen. Alright, maybe that’s pushing it, but perhaps without the manual. Or training. You definitely go through training before scuba diving, right? Right. Then that’s a fair comparison. So without aforementioned training, and with this relatively new medium (VR) and all kinds of new technologies (headsets, sensors, software, etc. ), you can imagine that quite a few challenges arise. We’re diving in head-first of course but are making sure to take all necessary precautions to make sure our VR environments are friendly, comfortable, and always fun. To ensure that the user has a physically comfortable experience, we chose a Head Mounted Display (HMD) that was effective in both practicality and usability. We are currently working with the Oculus Rift. This model is a lightweight (< 1 lb. ), comfortable HMD that you can slip over your head like a baseball hat. Just think larger, slightly heavier swimming goggles, but with the added benefit of transporting you to another world! Not too shabby for goggles. While it’s lightweight and has wide, soft straps to support it, the wearer does have to be okay with the weight and the fact that it covers your eyes. Just like a thrilling roller coaster or a quick-paced 3D movie, VR does come with the possible side effect of inducing nausea and/or motion sickness. However, we along with most developers are taking the time to craft steady, transitionally-smooth environments that will not provoke these kinds of reactions. Now it’s one thing to secretly (or not so secretly) love that little jump in your stomach once in a while, but most VR experiences should allow you move about and look around without any discomfort. Our main goal is for our experiences to be fun and positive, so to do that we created a few parameters. 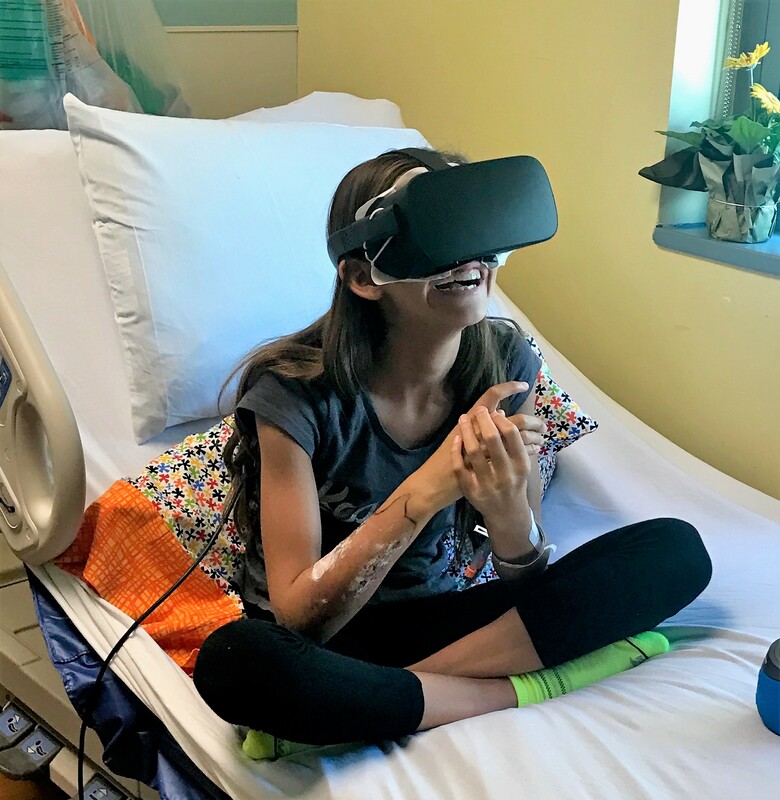 We have a simple form on our site (www.vrkids.org/request-a-session.aspx) that we encourage all interested parties to fill out prior to a session, and we recommend checking with one’s pediatrician/physician regarding VR in general. These precautions allow us to gather as much information as possible and confirm that no optical, physical, mental, or behavioral matters could perhaps step in the way of a great VR experience. We also believe a good age to start really working with children using therapeutic VR is about 7 years old. Now this isn’t saying anyone younger wouldn’t enjoy or benefit from it, but we find younger children to have bit too small of heads for the HMD. While this situation can be quite adorable, we don’t want them to have to hold the HMD up or feel that it’s too heavy. It’s really the little things that create genuinely positive experiences to products and situations, so we’re honing in on those details.